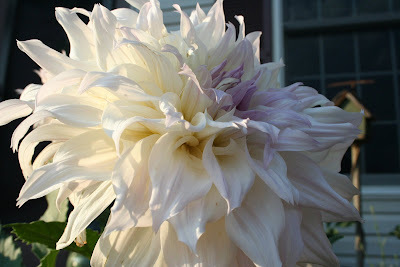 Bekah, is this is the flower that you are talking about, it's a Dahlia. In fact judging from the size it probably is a dinner plate DAHLIA. In other words HUGE! Very easy to grow, do you guys freeze there in the winter? Pull it out of the soil in the fall after the first frost, and throw it in the garage. Cut off all the foliage, and leave just about 2 inches of stem. Plant it again in the spring, when there is no more frost. Sunny SUNNY sunny, and it will bloom for you easily. Bekah, isn't that easy, you CAN do it. Go girl!!!! YAY i knew you would know! Its not mine..i saw it on our walk...so i think it might be odd if i run over and pull it out of the ground. We'll see. but you are right, that does sound easy, i might actually try that..with my own flowers...not other peoples! Thats frowned on from what i hear!